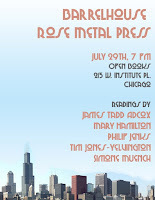 ...Rose Metal Press and Barrelhouse will be joining forces for an evening of literary fabulousness. See? Hope to see you there!